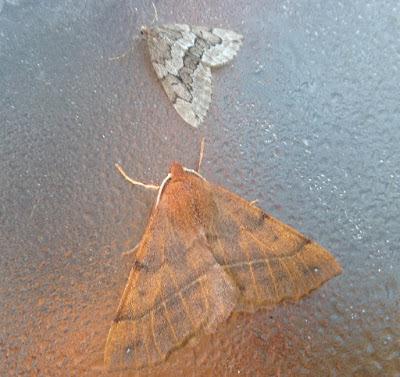 Two nights ago, just before the cold snap arrived, I found this attractive pair on the cowl of the dew-covered moth trap. 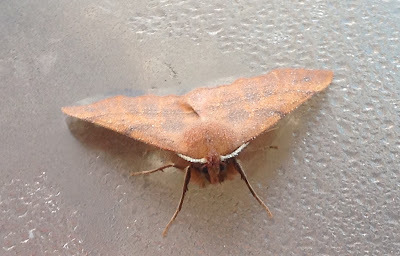 The lower one is a fine male Feathered Thorn, one of a small number of moths which fly at this time of year and are equipped with the equivalent of a gaberdine to keep them cosy. 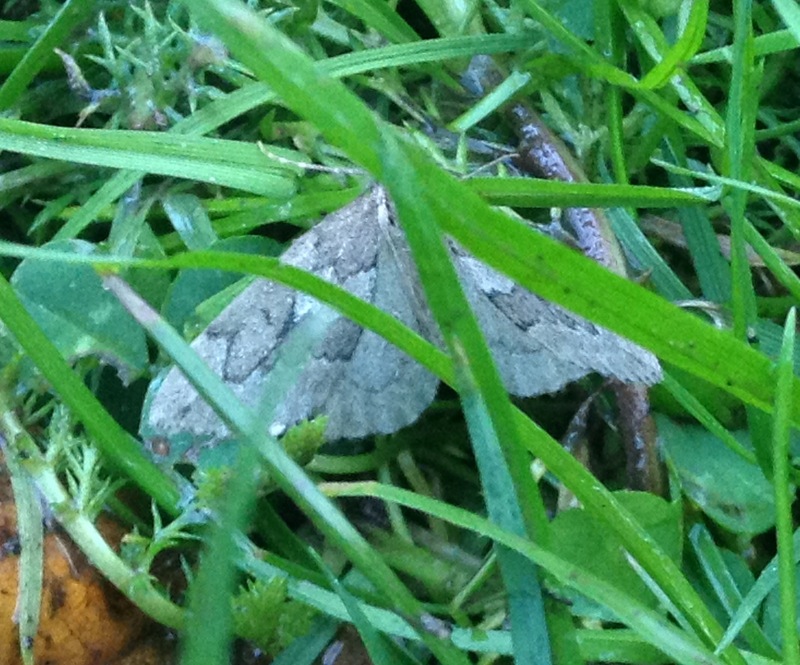 The smaller moth is a Juniper Carpet, a relatively infrequent visitor and one of a handful of local moths which have yet to visit the supreme expert Dave Wilton, who runs the Upper Thames Moths blog to which I so often refer. Another agreeable arrival was the Satellite, below, with its little versions of a lunar landing pod boldly marked on each wing. 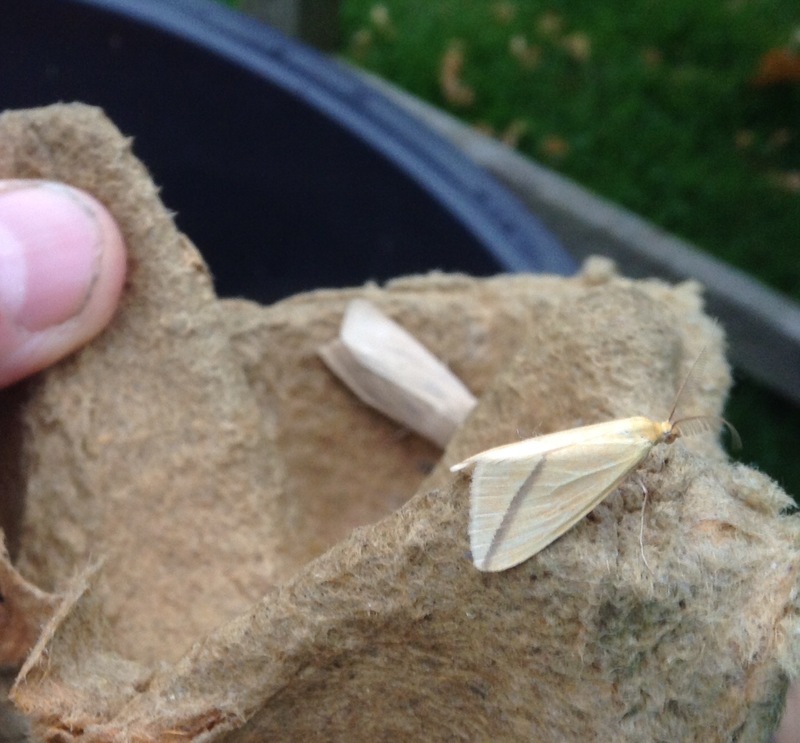 Meanwhile, last night saw our first frost of the autumn, so only the hardiest moths will be out and about between now and the Spring. A solitary arrival three nights ago, the first time that this has been the case for a while. 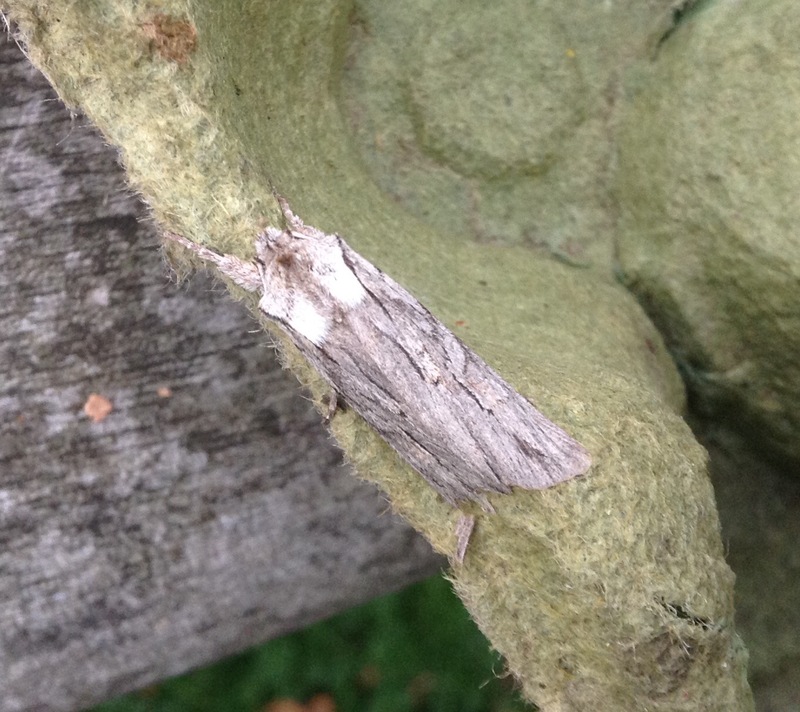 It's a handsome moth, though: the Sprawler, which always puts me in mind of heavy tweed suits as once worn by gents with pipes in Scottish fishing inns or London clubs. 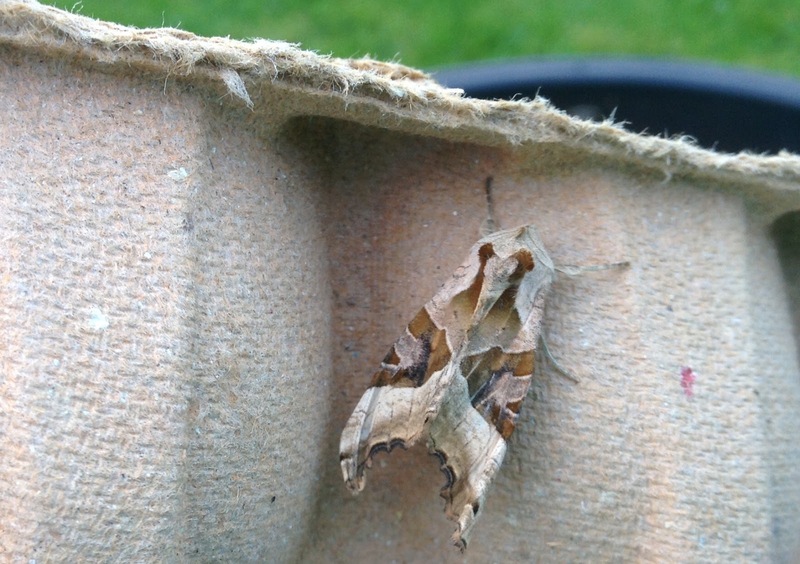 As with so many moths, the pattern is delightful and the colours very satisfying however subdued. 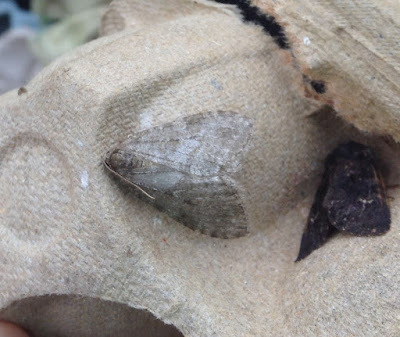 Talking of colours and patterns, I've been interested in the reaction of the Upper Thames Moths blog's great and very helpful expert Dave Wilton to the highly distinctive Blair's Shoulder-knot which I described here the other day - the one with two white patches on its shoulders, suggestive of an ermine collar to a robe. He commented: 'I've not seen Blair's Shoulder-knot with such an obvious white thorax but that probably doesn't mean much'. 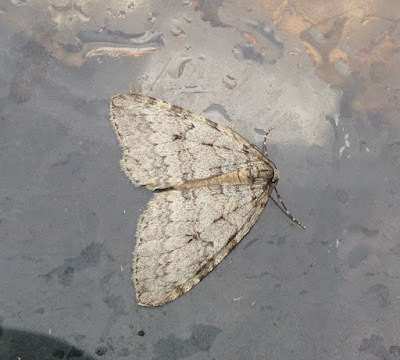 I think this is right, in that moths within a particular species can be extremely varied in wing pattern and colouring with out differing in any other physical way. But to the amateur like me, such variations are fascinating. 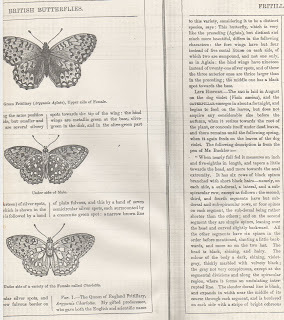 It was identified for me by the learned and very kindly head of natural history at Leeds City Museum, John Armitage, who initially assumed that it was a foreign butterfly which I must have found on holiday. It was indeed a holiday capture, but on Goonhilly Down in Cornwall (in exactly the same spot where the great entomologist Prof E B Ford caught one of the few Monarch butterflies - the famous migratory American species - to be found in the UK). 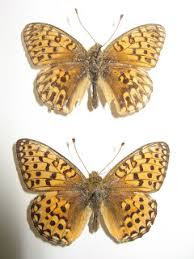 The butterfly, shown above and below with the standard Dark Green Fritillary (below in the top pic, above in the bottom one, sorry for the confusion), is known as aberration Charlotta. It's the top specimen in the cabinet which I keep from my long-ago collecting days. Here's a first. 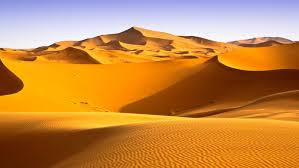 I've never started a post with a picture of the desert before. But the Sahara plus Hurricane Ophelia and now Storm Brian (sounds a bit weedy by comparison, but it's done its bit) have been sending some interesting moths to the UK. 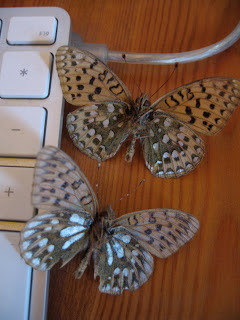 They don't fly, or at least hardly. 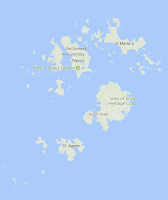 They get scooped up and hurtled north. So it's largely a matter of simply staying aloft while the weather does the motoring. 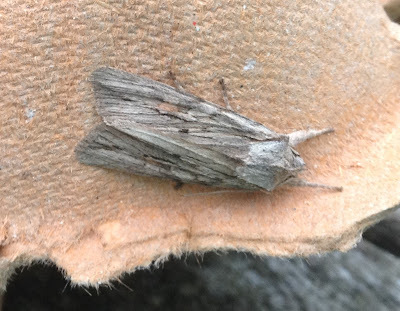 The latest shivering arrival (presumably, although adult moths are less sensitive to the cold than their caterpillars and, in particular, those caterpillars' foodplants) is this Scarce Bordered Straw which also rejoices in the alternative name of the Old World Bollworm. If that suggests to you an American connection and a fondness for crops, you are right. The SBS can be a serious pest. However, it will do no damage here and I have never seen one before. So, Hooray! A more familiar immigrant from the hotlands is the Vestal. 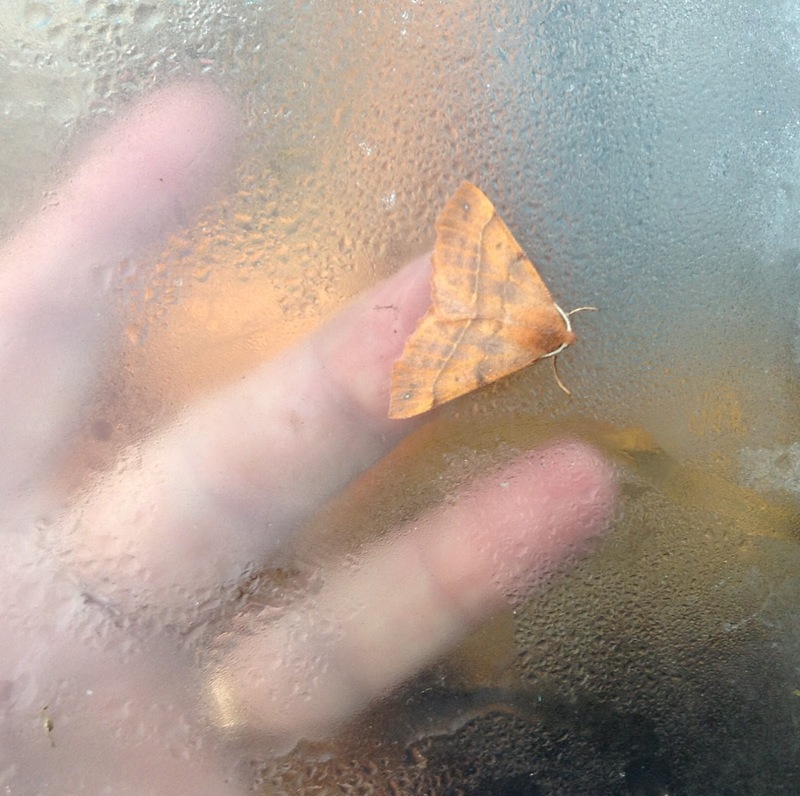 They are coming regularly now, when the nights are not too wet and cold - they have been both of late, until it warmed up and dried up yesterday evening. 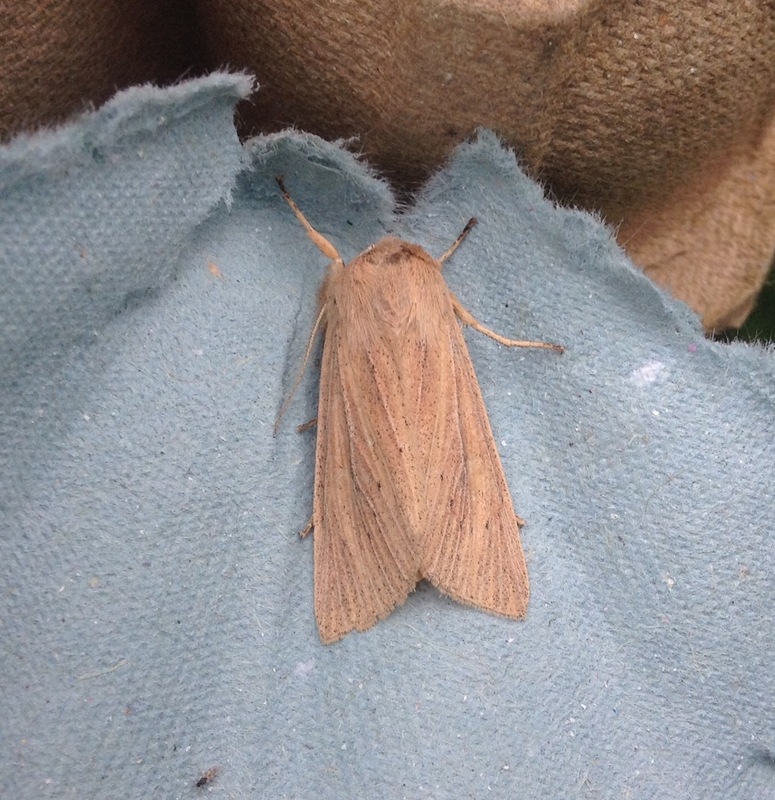 Another good moth in the background is also around in numbers: the Large Wainscot. 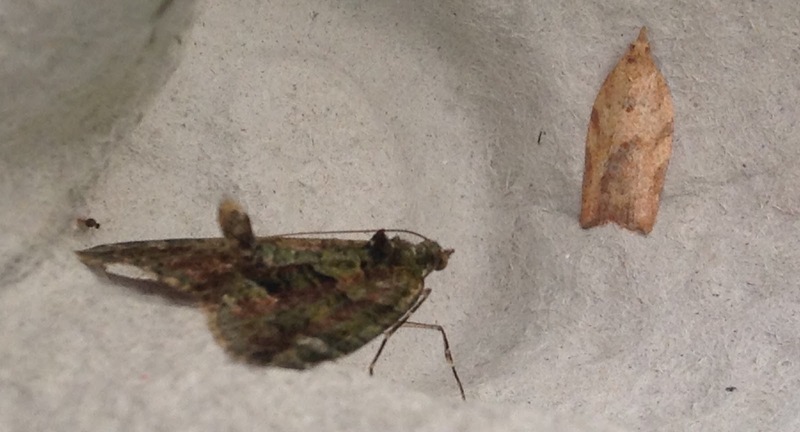 I'm particularly pleased with my last moth, too: a very unusual-looking Blair's Shoulder-knot. Many of these are also immigrants albeit only from the Continent, but they have also settled here and breed regularly. Their normal background colour is grey, with occasional pinkish streaks and all those dots and dashes, but this one has these extremely distinctive white shoulders. 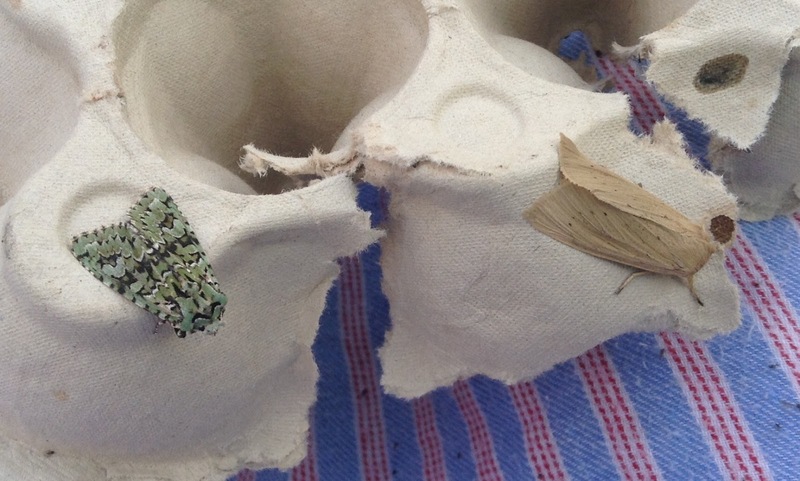 An ermine collar. Is that an omen for the political future of our former Prime Minister, Tony Blair? 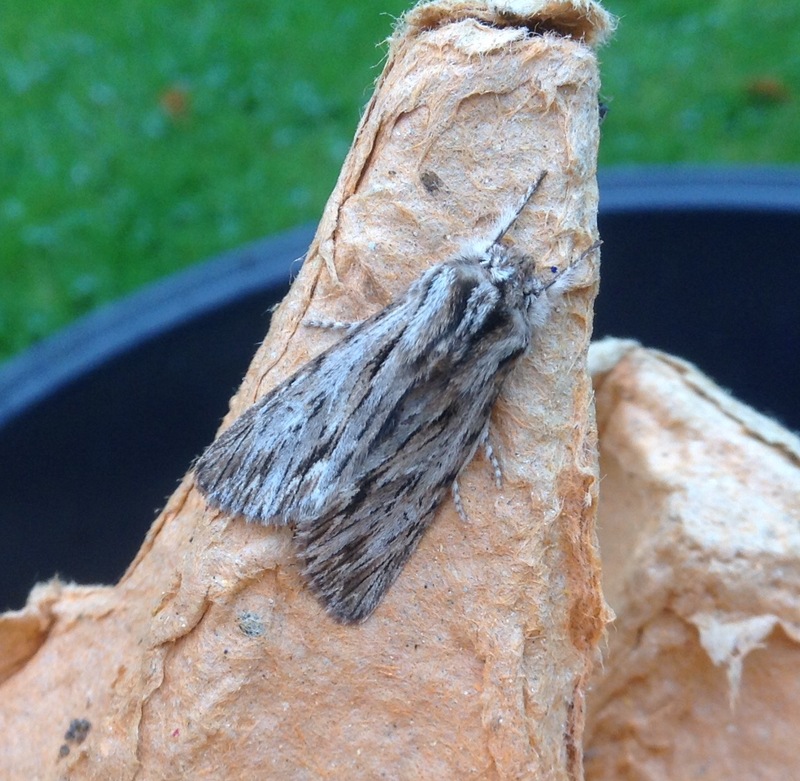 We had a foggy journey back from London late last night and the garden was misty and very still when I put the trap out a little before midnight. 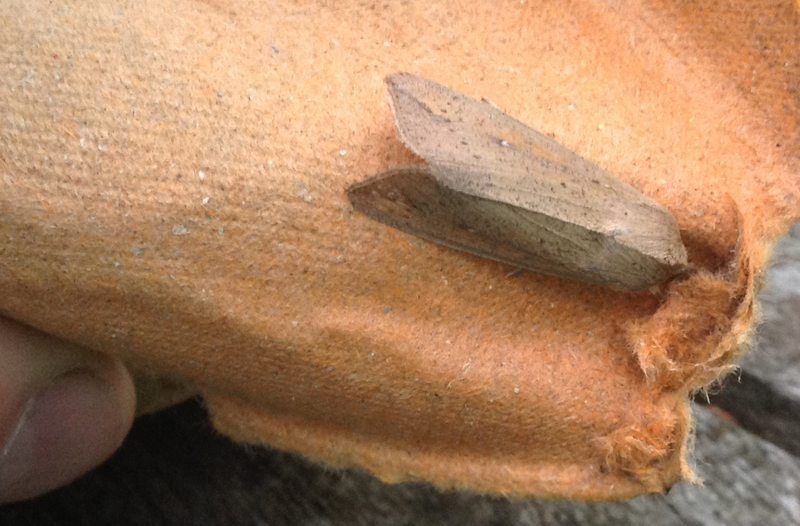 I was clearly sleepy, too, as this morning I found that the transparent cowl had partially slipped off. Conceivably, a fox or badger might have nudged it but it would be a very brave animal that ventured so close to the dazzling mercury vapour light. Luckily, the extra gap hadn't enticed a couple of interesting arrivals to escape: my first two pictures show an immigrant Vestal, a species from the Mediterranean which has been arriving in unusual numbers in this part of the UK on the tailcoats of Hurricane Ophelia, as mentioned in recent posts. 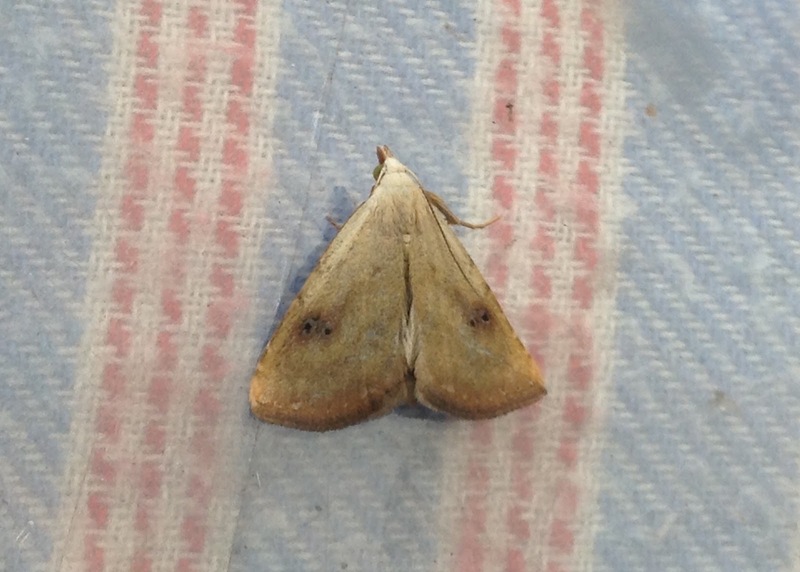 You can tell that it is an immigrant because of the yellowy shade which is generally found in Vestals from warmer climes which have spent less time in their chrysalises. The ones which breed in Northern continental Europe and here (from eggs laid by immigrants earlier in the Summer) are paler and closer to Hollywood's ideal of the clothing worn by ancient Rome's Vestal Virgins from whom this dainty insect takes its name. My composite picture below contrasts this morning's arrival - on the left - with one which came in September 2013 and an NBC picture of Janet Stephens in a Hollywood Vestal role. 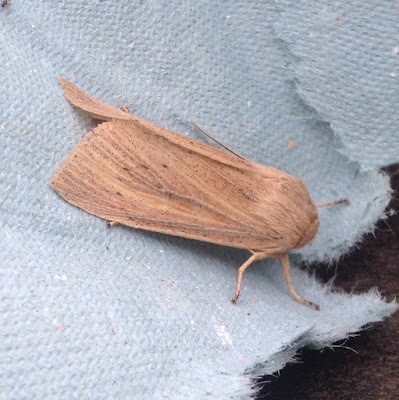 It was also good to welcome a Sprawler, that tweedy regular in mid-Autumn, and to see another Large Wainscot - all shown below. 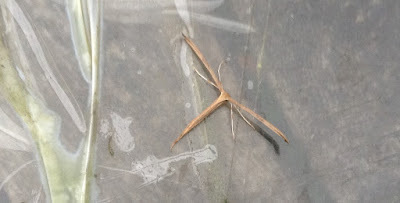 On the smaller side, I think the Plume moth with its distinctive T shape is probably just a Common Plume, Emmelina monodactyla, but if anyone knows different, please shout. Great skies; but where are the moths? 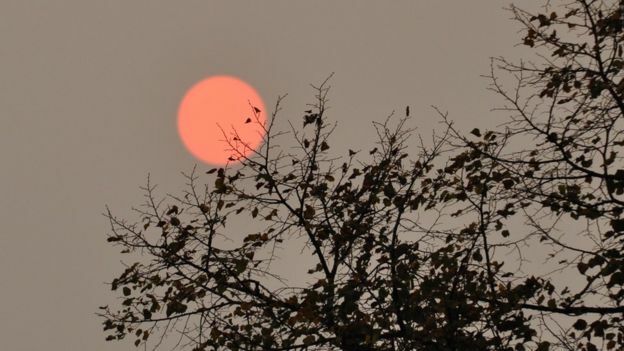 As much discussed in the UK, we enjoyed delightfully spooky weather yesterday, variously described as a Red Sun and Marmalade Skies. 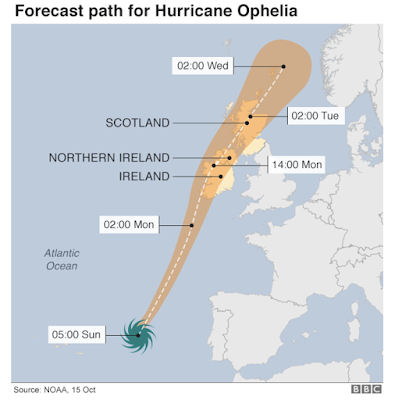 The latter was closer to accuracy so far as we were concerned; until early afternoon, we were bathed in a weird, orangey glow caused by sand swirled up from north Africa by mighty Hurricane Ophelia, along with ash from fires in Portugal and Spain. 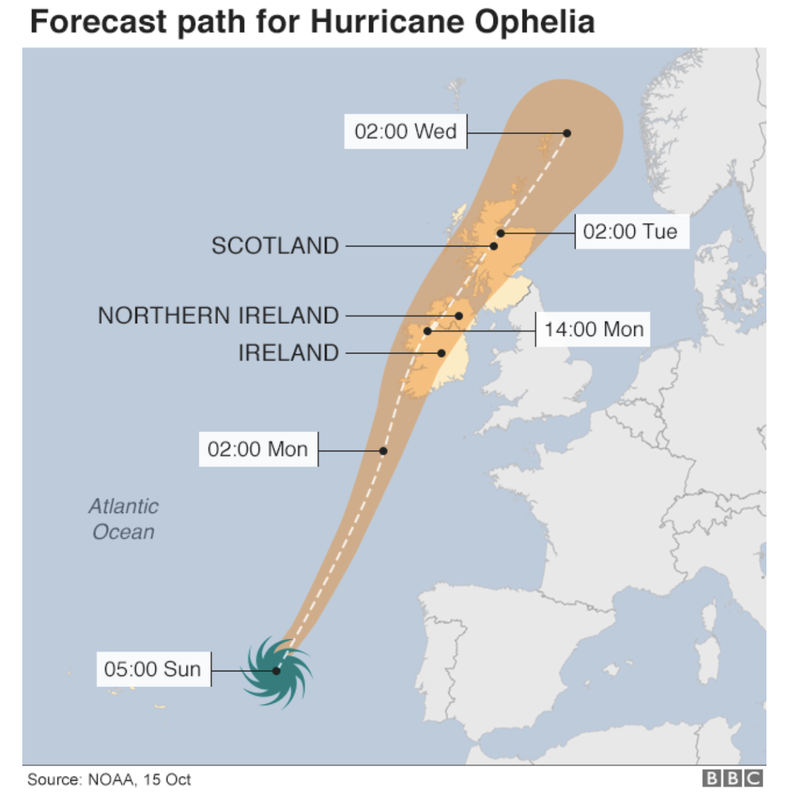 When we saw the sun, it resembled the photo from the BBC's website on the left, but most of the time, the other pic from the BBC on the right gives a better and more marmaladey impression. 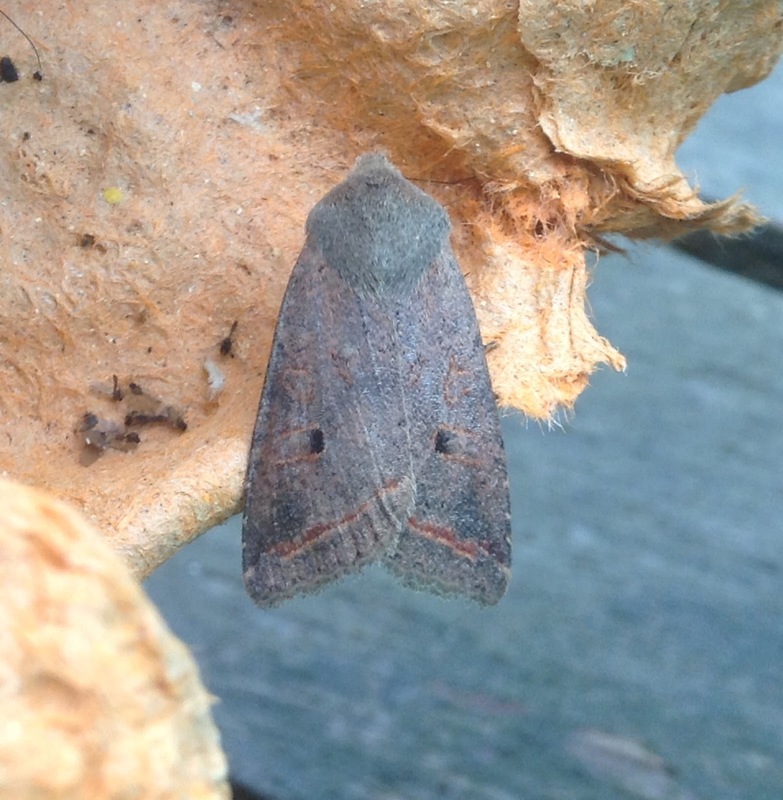 Along with many others, I was optimistic that these conditions would be reflected by curious, long-distance arrivals in the moth trap. But that was not the case. 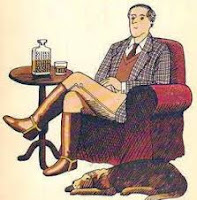 I blame the wind which got up in the evening and the temperature, which fell. Although I saw a couple of moths fluttering close to the lamp before I turned in, the eggboxes were very sparsely populated this morning. 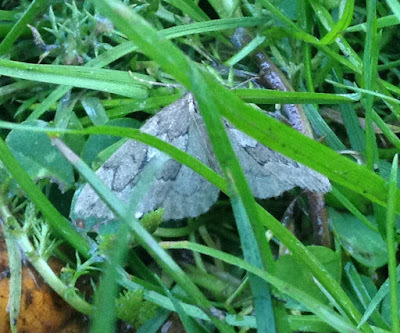 Indeed, the only moth which I thought worth showing you was this Angle Shades, a long-standing favourite which hasn't been for a while. 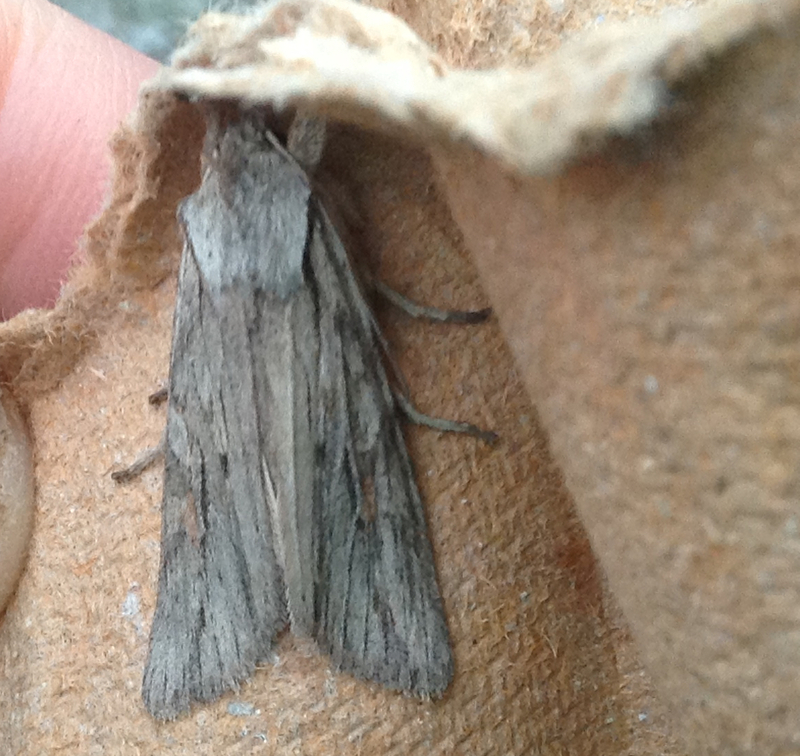 Perhaps its stylishly raked wings allowed it to risk the 40mph gusts which lasted 'til midnight. 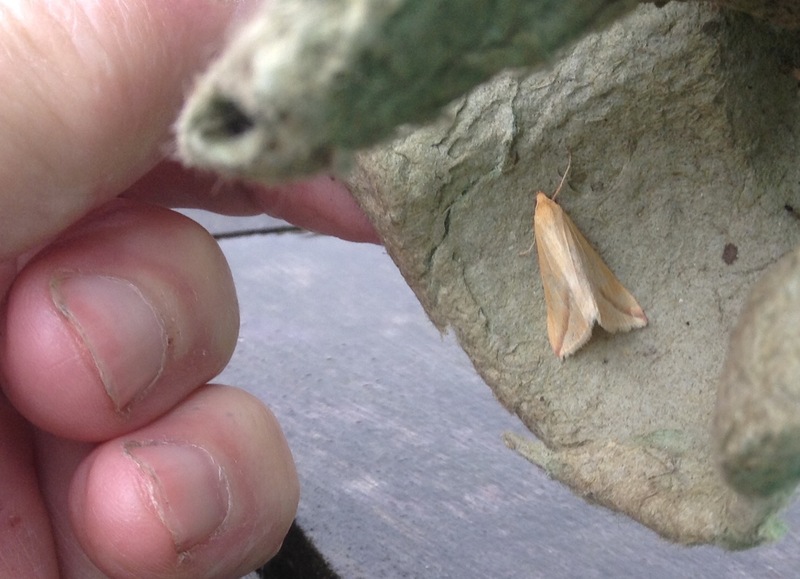 My other moth curiosity, below, was on board a friend's boat which took Penny and myself for a memorable saunter along the Thames, including a call at the wonderful Egyptian House in Moulsford, left. These are the tragic remains of that lovely and aptly-named species, the Bordered Beauty. 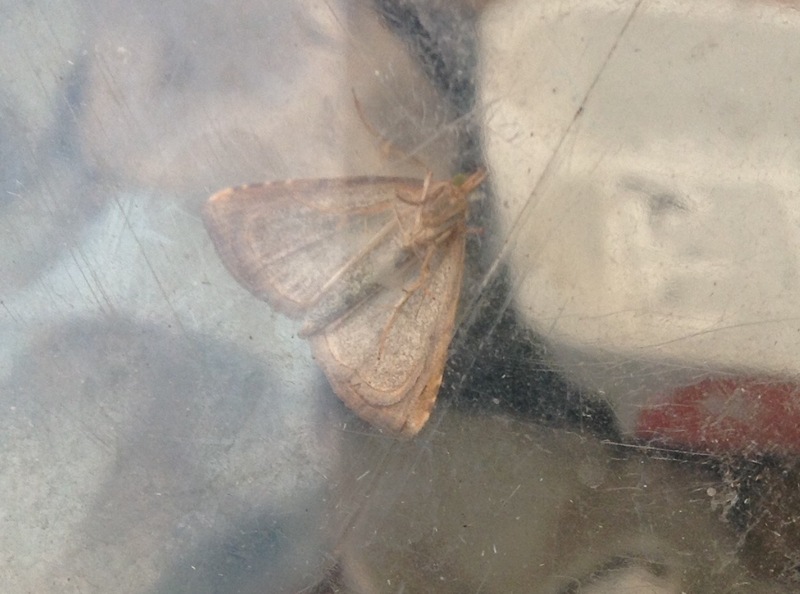 I suppose that they show the efficiency of spiders at filleting out a moth's juicy, edible bits. 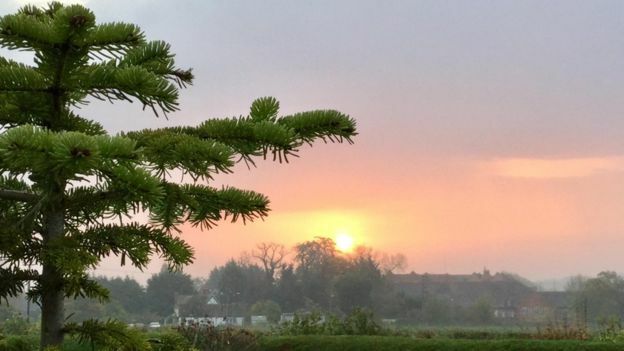 I am running a day behind these days, with daylight coming too slowly and too late for me to scribble out the blog post before life's other demands kick in. 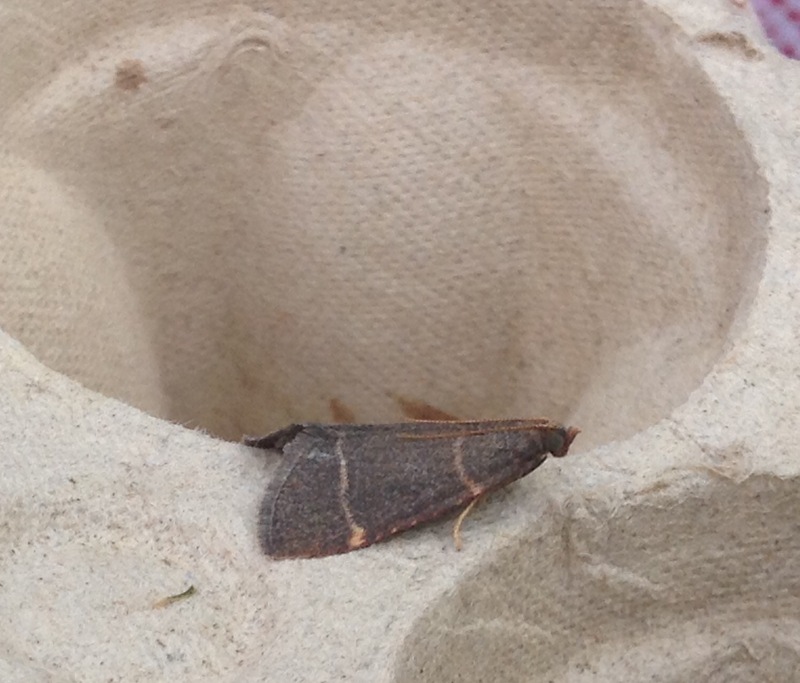 Today's handsome whopper therefore visited me on Sunday night and provided a nice surprise yesterday morning. It's a Large Wainscot, suitable named as you can see when you compare it with the Common Wainscot which also stayed the night. Here they are below, waking up slowly in the company if a Merveille du Jour, that star of the UK's Autumn moths. The Large Wainscot is not that common round here but it has come calling for the last three years. 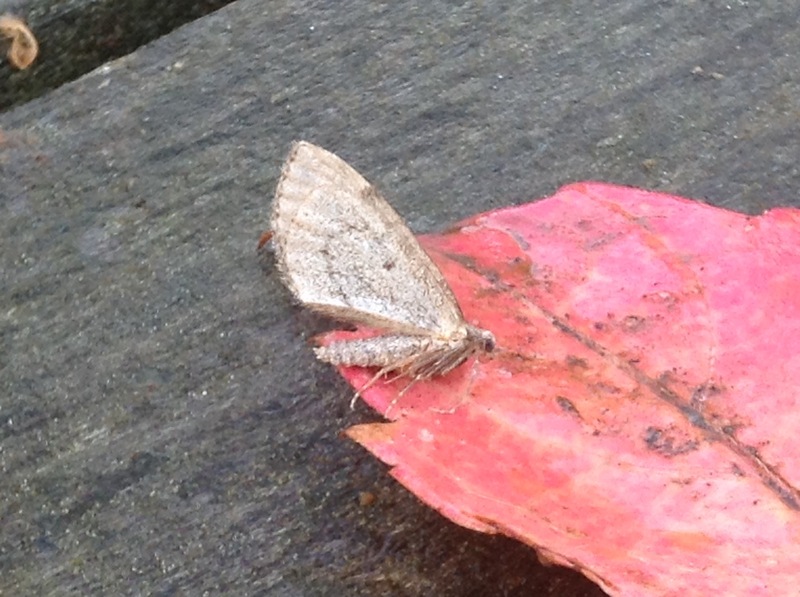 It likes watery spots and we have both the Oxford Canal and the River Cherwell nearby. A curiosity of its behaviour is that it flies twice a night, briefly at dusk and then for a longer spell later on. Superficially it resembles the White Speck which filled me with such joy yesterday, and inded my first thought on seeing the WS was that it was an LW. I rhapsodised about the Green-brindled Crescent two days ago. Its appearance is usually followed by that if its very close relation, the form cappucino, and this has duly happened again this year. 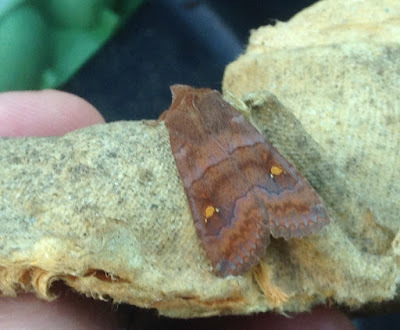 Here it is, above, a darker and less blingy version, with the brown body and creamy top associated with the coffee (and the Capucin monks after whom both drink and moth are named). 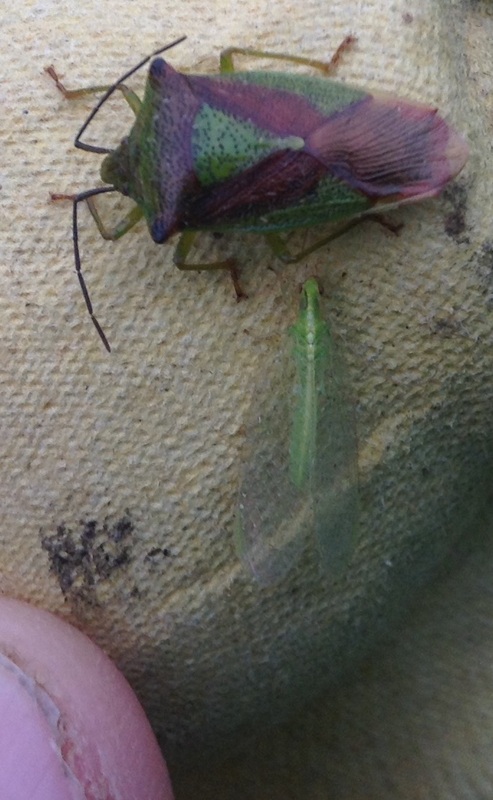 The standard, glisteningly green form is on the left. What was it? I lifted the bulb and its holder out carefully and upturned the collar gingerly. 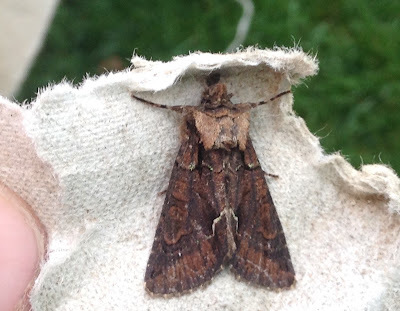 The moth stayed put and posed for a picture, resting on my beautifully pyjama-glad knees (the jams looking a bit grubby because the collar is between them and the moth). 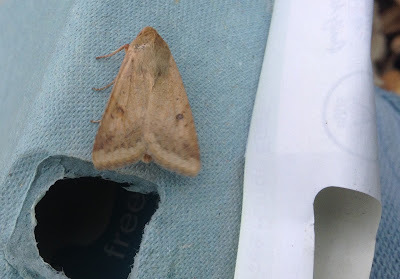 It's a Straw Dot, one of the macros smaller than Hypsopygia glaucinalis, which is enjoying a good long season this year. Finally, a series of tortrix micros: a fine, fresh example of the Garden Rose Tortrix, Acleris variegana, which last arrived two nights ago in the form of a very battered specimen; the puritanically grey Acleris sparsana and the Light Brown Apple Moth, Epyphias postvittana, with a jauntily tail-cocking Red-green Carpet looking on. 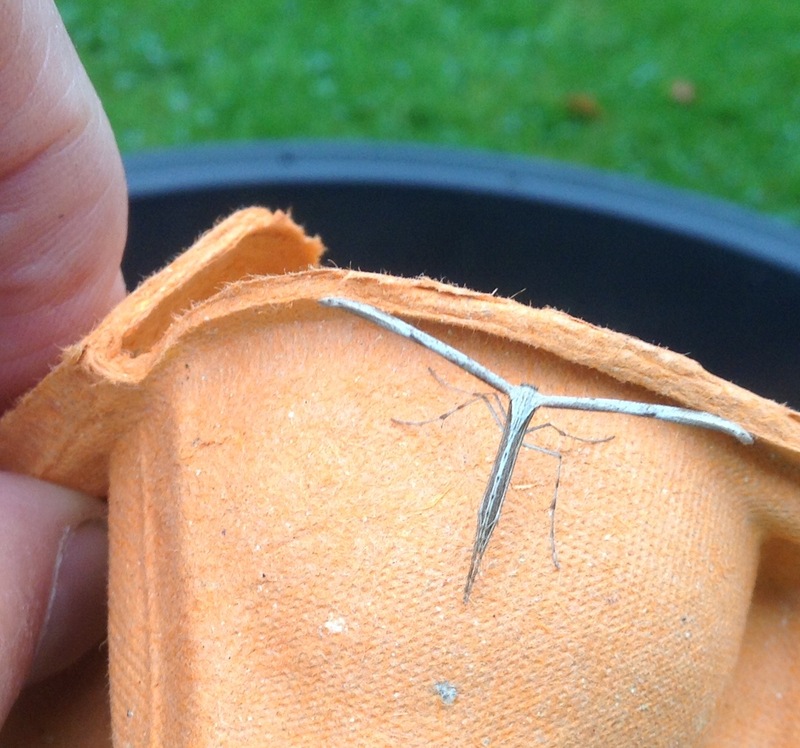 It's childish I know - or perhaps we could settle more kindly on 'child-like', but I still get a kick out of finding unusual moths in the trap. 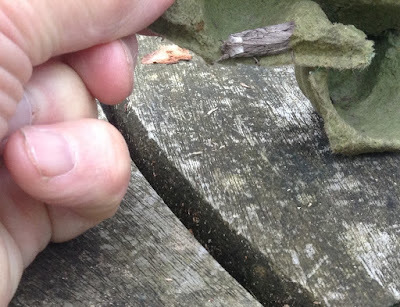 This is a pretty infrequent experience and now that we have been here for five summers, it's a surprise to find anything which hasn't called at least once before. But that was my experience yesterday morning, after the last of National Moth Nights' three nights. 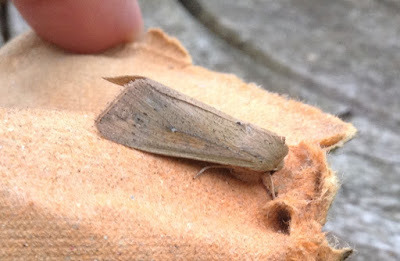 The visitor was a White-speck, an immigrant species which makes landfall in the UK every autumn but only seldom this far inland. 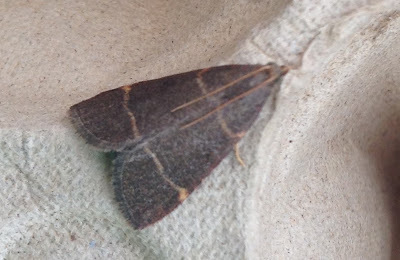 Martin Townsend, the co-author of the Moth Bible and an unfailingly helpful mainstay of the Upper Thames Moths blog, says that there have only been a few records for Oxfordshire. Now mine joins them, huzza! 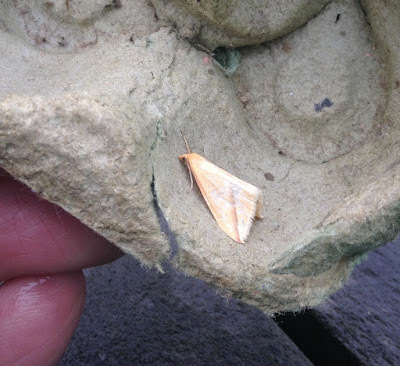 It nearly didn't, firstly because I turned the moth's eggbox over clumsily after examining the other side and nearly dislodged the un-noticed White-speck in the process. And secondly, because I initially took it to be one of the less common wainscots. 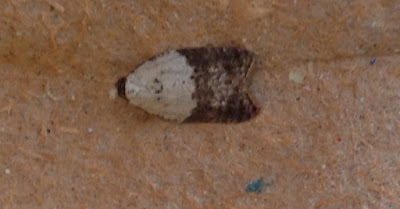 Luckily, there was something about its shape and the beady, eponymous white speck, which kept me searching through the Bible. 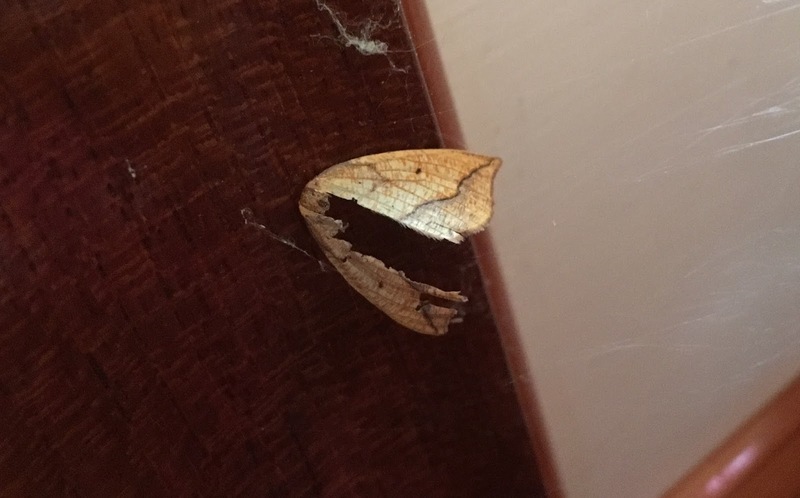 It isn't a specially exciting moth to look at, as you can see, but it has a sleek, streamlined appearance which makes for a purposeful impression. In the United States where it is common and a major agricultural pest, it is known as the Armyworm because its voracious caterpillars can assemble in large numbers and march on crops. The Americans' usage of 'worm' for caterpillar, by the by, is an example of how their version of English has kept alive old forms which we have discarded; 'worm' is one and 'gotten' another. Worth remembering, when we criticise them for their many novelties. Why a White-speck now? 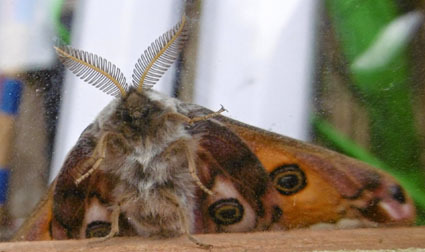 It is one of an army of immigrant moths swept north from the Continent on warm winds caught up in the train of the remains of Hurricane Ophelia. 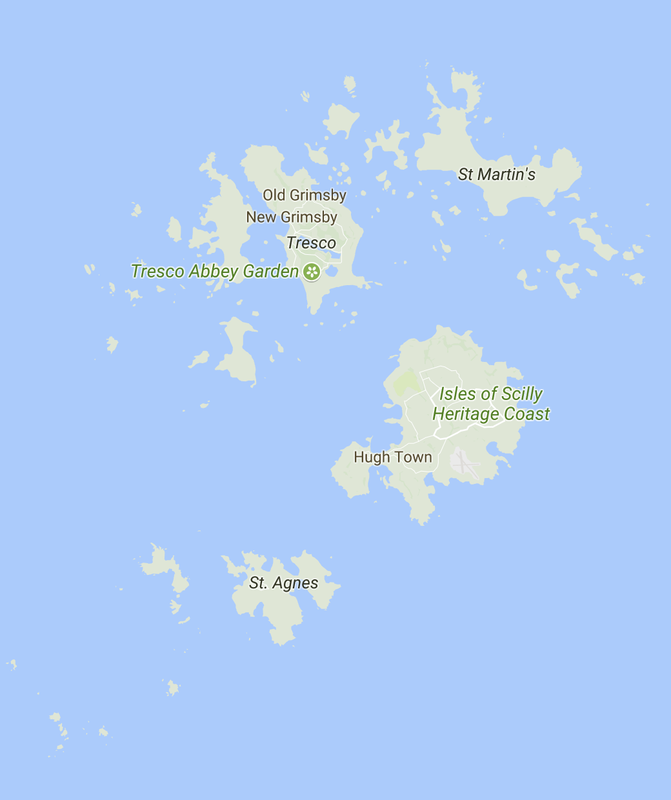 White-specks usually head for Devon and Cornwall and have even established breeding colonies in the far south west, including the Isles of Scilly. On your guard, daffodil-growers! Back on National Moth Night, I was visited by another attractive immigrant and one which has settled here bigtime, Blair's Shoulder-knot, above, one of three UK moths which carry the name of a retired entomologist from the Natural History Museum, Dr Blair, who lived on the Isle of Wight where many species new to the UK first make landfall as the Shoulder-knot did in 1951. It shares the sleekness of the White-speck but has a rather more handsome, Tweedy appearance. 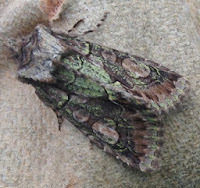 It also has a look of the Pinion moths and Dr Blair modestly suggested initially that it should be given the agreeable name of Stone Pinion. 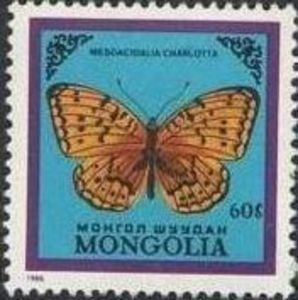 But others disagreed and wanted him honoured for his tireless discoveries and so the moth joined the much rarer Blair's Mocha and Blair's Wainscot. And its Yellow-line cousin. 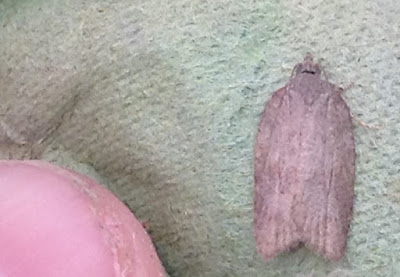 Update: Paul in Comments suggests that this is a Brick and I am sure that he is right. 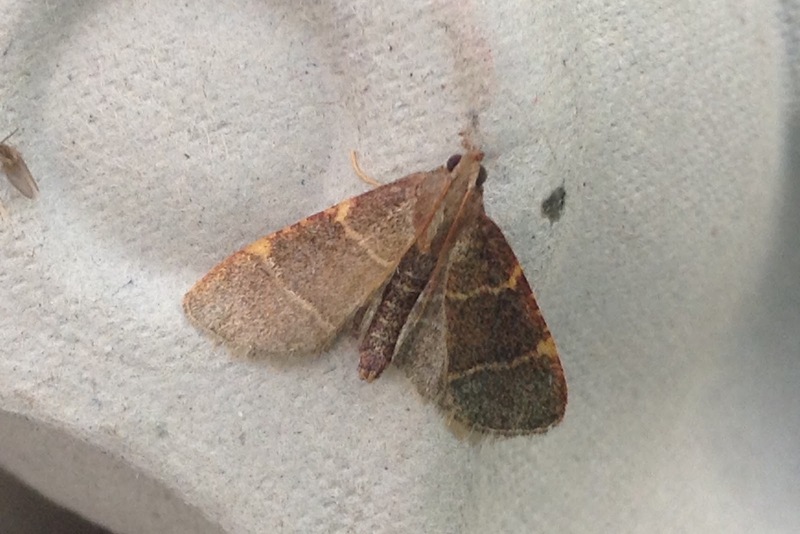 Many thanks again P.
And one each of Sallow, Barred Sallow, Square-spot Rustic, Autumnal Rustic, Centre-barred Sallow, Lesser Yellow Underwing, Red-line Quaker, Yellow-line Quaker and the micro Brown Plume, Stenoptilia pterodactyla, below.